A key signaling scene in Denis Villeneuve’s compelling sci-fi film Arrival involves two characters discussing a linguistics theory which posits that the structure of the language a person learns vitally shapes their perception of the world. This is the Sapir-Whorf hypothesis or the principle of linguistic relativity, and I won’t even pretend that I can tell you anything more about it than what can be learned from the Wikipedia article. But the concept is central to the conception of initial human contact with extraterrestrials in Arrival, which is surely one of the finest films of the year. Arrival is so fine not merely because of its high level of visual distinction or the superb central performance from its star, Amy Adams, who plays a linguistics professor brought in by the U.S. government to attempt to communicate with inscrutable aliens. What makes Arrival so very good (borderline great, even) is how Villeneuve exquisitely and movingly melds its provocative intellectual depth with an irresistible (borderline manipulative, even) swell of emotional heft. These elements, so often simplistically understood as separate and indeed oppositional, combine and reinforce each other in Arrival in a symbiotic feedback loop that builds to a significant impact by the narrative’s conclusion. That conclusion, in concert with the film’s circular ideas, imagery, and iconography, is the same as its beginning. Or rather, the same with a critical difference of perspective; a reflective mirror image whose meaning and emotional affect shifts considerably with the intervening accumulation of knowledge and experience (the Coens did something similar in Inside Llewyn Davis, but with cosmically ironic distance and nothing resembling Arrival’s passionate punch). 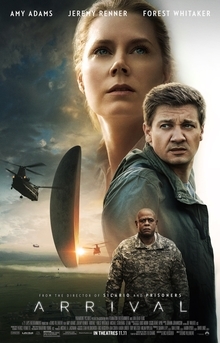 If that description sounds like a metaphor for our progress through life, our present course haunted by memories of the past and hopes for the future in equal and diverting measure, Arrival can be tentatively summarized as such a metaphor as well. It’s more than metaphor in the opening and closing sequences. Aurally accompanied by Max Richter’s “On the Nature of Daylight” (a.k.a The Saddest Music Ever Made), Villeneuve liberally plucks heartstrings with a rending montage of tender memories (if, at risk of spoiling too much, they are memories) of Adams’ Louise Banks’ time with her beloved daughter Hannah (continuing the circularity, her name is a palindrome), who dies in her teens of a rare, fatal disease. The opening montage is devastating enough (it packs much of the tone-setting emotive clout of the life-and-loss prologue of Pixar’s Up, to make a perhaps-surprising comparison), but the closing one, given the information revealed in between the two, has an even greater impact. Flashes of Louise’s life with her daughter trouble (and sometimes subtly direct) her efforts as part of a team of American specialists attempting to establish communication with the mysterious visiting beings. Their towering black pod ships resembling smooth, oval-shaped obsidian stones settle and levitate in 12 seemingly random locations distributed across the globe, including in Montana where Louise and her team are working. A portal at the base of the craft opens every 18 hours, allowing human visitors to enter (the Montana team employs scissor lifts to access the opening fifty feet from the ground, one of Villeneuve’s many details of grounded realism) and parlay with the octopus-like creatures, dubbed Heptapods, suspended in a misty haze behind glass. Louise is aided by Ian Donnelly (Jeremy Renner), a theoretical physicist, and supervised by U.S. Army Colonel GT Weber (Forest Whitaker) and a CIA agent (Michael Stuhlbarg), and the Montana team shares information with the other 11 teams around the globe. Some of these teams, namely the Chinese as spearheaded by General Shang (Tzi Ma) and the Russians, are more mistrustful of the Heptapods’ intentions, and are more inclined towards shows of force towards the visitors and towards uncooperative info-hoarding in relation to their fellow human communicators. In addition, the constant stream of television news in the film reveals a world in distress and upheaval at this ambiguous contact with beings from beyond our world, full of demonstrations and doubts and paranoia and incitements to violence (some of which penetrate the Montana team). Villeneuve’s use of ubiquitous media screens does tangibly approximate our modern cultural experience and how the broadcast media simultaneously disseminates and fosters mass discontent, but if Arrival has a flaw, it’s that it relies too heavily and too clunkily on expositional media broadcasts to advance the global dimension of its story (the script, adapted by Eric Heisserer from Ted Chiang’s short story “Story of Your Life”, is otherwise uncommonly excellent). Arrival holds this worldwide scope mostly in the background, although Villeneuve does unleash some epic shots on his relatively modest budget: the sustained airborne pan of our protagonists’ helicopter arrival at the Montana site is a ravishing stunner. The focus is on Louise and those around her, straining to comprehend the Heptapods’ guttural utterances and, more importantly, their “written” language. This orthography takes the form of black inky circles (there’s that shape again) projected from their tentacular appendages, with splotchy markings along the circumference differentiating the characters one from another (they more than mildly resemble the orbital-view outline of the Manicouagan Reservoir, an annular lake created by a meteor impact crater in the north of Villeneuve’s native province of Quebec that may have provided visual inspiration). Louise and her collaborators work out that these are not letters but complete concepts, ideas, or statements not directly connected to spoken phoenetic language, closer to Chinese characters than the Latin alphabet but even more distinct, more complexly expressive, and unmoored from not merely tense but from linear conceptions of time. Ian describes the Heptapod “letters” as being akin to writing a sentence with both hands at once, all while knowing precisely the space required between the fragments to complete it. This description suggests not only the communicative and temporal sophistication of Heptapodese, but the structure of Arrival itself. It also points in the direction of the aliens’ intent on earth, and the particular perception of time that comprehending their language confers upon a living being; in this peculiar case, Louise. Tempting though it is to discuss the plot particulars and implications of Louise’s cracking of the Heptapod code, Arrival is good enough to merit restraint and to deserve individual revelation (though enough hints and details may have already been dropped to make it obvious to the perceptive reader). Villeneuve’s filmmaking is restrained and greatly suspenseful, and although Heisserer’s screenplay crescendoes with a mind-bending twist, it’s made to feel not merely natural but uncannily inevitable. Tremendous credit is due to Amy Adams for selling the emotional insinuations in concert with the intellectual fascinations. When I write that the focus is on Louise throughout, I mean it very literally: Villeneuve’s camera maintains a proximity to Adams’ face in numerous moments, key and otherwise, that is intimate to the verge of discomfort. But his star never disappoints in these close-ups, imparting a depth of not only thinking but feeling that firmly but gently prevents even Arrival‘s biggest reaches from presenting as pretentious mind-puzzles or feeling like maudlin manipulation. Adams has long been a prodigious actress who is frequently cossetted by stock supporting roles (watching her paw through the wreckage of Batman v. Superman looking for a core of truth from which to build her Lois Lane was one of that film’s myriad tragedies). To make a horribly reductive pun, in Arrival, she arrives as a movie star. Denis Villeneuve, too, arrives as a top-tier director with this film. In the nick of time, really, what with a high-profile Blade Runner sequel coming with him at the helm. Arrival is not only a resonant philosophical work but a keenly-felt tear-jerker, and it summons general political subtexts in the best provocative science fiction tradition. In a modern age of alienation and mass miscommunication, it employs aliens to emphasize the value of mass communication, of cooperation, of striving for understanding and empathy rather than settling for the easy escape hatches of inchoate resentment and hateful force. Louise Banks urges caution and consideration to Colonel Weber at a key juncture, reasonably positing that the Heptapods may not be able to distinguish in their language between the word-concepts “weapon” and “tool”. Arrival recognizes that language is both a tool and a weapon and fervently hopes that it can be used for good rather than ill. It also handsomely demonstrates that cinema as a language is both a tool and a weapon, and shows how it can serve the good in the human world. Sounds compelling. I will try to see this on the big screen. Perhaps in Palm Springs. This was a thoughtful movie. It made me think about how humanity would respond if there were a “first contact.” This movie takes a meaningful and surprising turn toward the end.